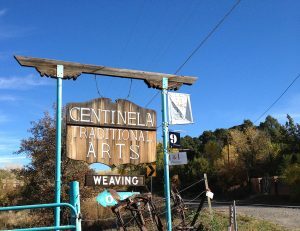 When I pulled into the driveway of Centinela Traditional Arts in Chimayo, NM, it was a relief after slaloming within a string of cars along a winding ribbon of two-lane black-top lined too close for comfort by gates and houses. Google maps did not indicate many landmarks along this road and it was by chance that I saw the sign and that there was no oncoming car at the moment I needed to turn left into the driveway or overshoot. I met Lisa Trujillo and her daughter Emily. 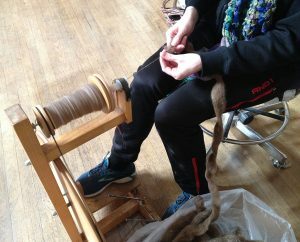 They showed me around the shop and showed me newly shorn churro wool, wool that was “in the grease” (ready to be washed), and “prepared roving” (wool that has been washed and is ready to be spun) and Emily demonstrated the spinning of prepared roving wool on a spinning wheel. Lisa took me out to the farm out back where the family keeps a small herd of churro sheep. They use this wool for all of their traditional weaving. 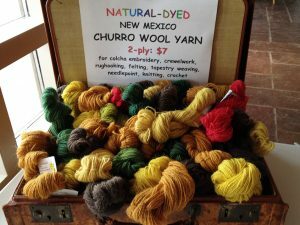 Churro was the original breed of sheep brought by the Spanish to this region in the 16th century, the wool from which has been used for weaving since that time. The sheep are of varied colors, accounting for the natural white (cream) and the range of natural colors in the wool of grays and browns to almost black. The fine undercoat is used for weft wool which makes the surface of a weaving. The coarse outer coat is strong and used for the warps (structure) of a weaving. 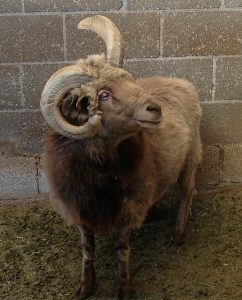 I have seen photographs of this breed, always with symmetrical horns. But these sheep had horns of every size, pointing in all directions, making them very cute to look at. Irvin Trujillo took me through a brief history of Rio Grande weaving, showing me examples from the textiles hanging on the walls. His is the seventh generation family of weavers who have passed their craft and dye recipes down to each succeeding generation. 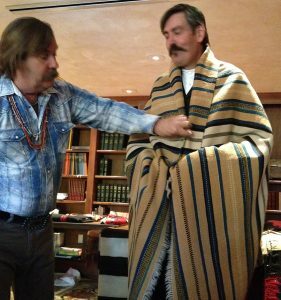 He showed me photographs of wedding blankets, woven and gifted within his family, which are Rio Grande textiles that are mostly natural white. He took me through the weaving room where three enormous looms, each with weavings in progress, are set up so they almost touch corner to corner along three walls of the room. Last we looked through the outdoor dye shed where the family dyes all of the wool they use in traditional weavings using only natural dyes. Lining one wall were very large stock pots holding a variety of natural dyestuff materials and skeins of wool bathing in the dyes. 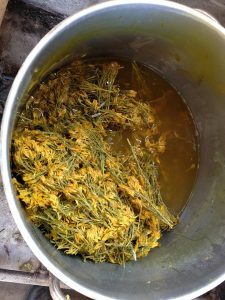 Some of the dyeing in process included chamisa (the blooms from rabbit brush which produce yellows) and indigo (blues). The intensity of the dye depends partly on how long the wool remains in the bath, from overnight to several days. Irvin showed me some of the dyestuff materials: cochineal (insects that produce a brilliant red), lumps of indigo (processed from the native Mexican plants), and brazilwood (pieces of heartwood that make reddish tans to golden yellows). 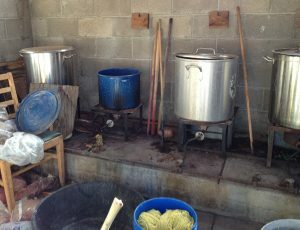 Upon removal from the dye bath, the wool dries, and then is rinsed until the water runs clear. 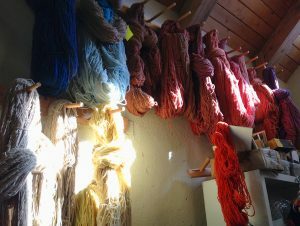 In their shop hung many skeins of churro wool, natural-dyed in a myriad of colors, waiting to be used in weavings. 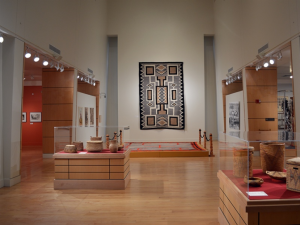 I visited the Northern Rio Grande National Heritage Area Center in Alcalde, NM (outside of Española, NM), to view the 5th Biennial NNM Spanish Colonial Colcha Embroidery Exhibit. A Colcha is a type of Rio Grande textile in which decorative embroidery has been added to Sabanilla cloth. Sabanilla is a utilitarian coarsely woven textile, with yarns handspun from natural white wool, and was made primarily for sheeting. 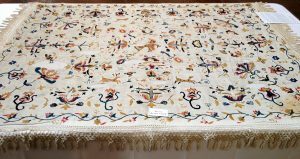 These embroidered textiles were often used as bed coverings. I met Leland Chapin, co-curator of the exhibit, who showed me around the exhibit, the bulk of which was of contemporary Colcha embroidery work, still made in the traditional manner. 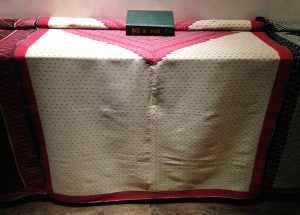 The exhibit did include four old large Colcha textiles, dating from circa 1865 to 1885, on loan from Mark and Linda Winter. The Colcha embroidery sometimes takes the form of patterns which cover a portion of the Sabanilla cloth, as in the above floral example. Colcha embroidery may also completely cover the surface of the cloth, as in the example to the right. 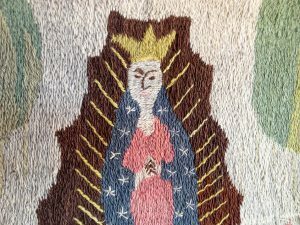 This is a detail of a large Colcha that was embroidered with the images of eight saints. In this piece, the texture of the embroidery yarns becomes the surface of the cloth. A table at the rear of the exhibit held skeins of handspun, natural hand-dyed wool in a variety of colors, together with samples of some of the natural plants and minerals from which the dyes are made. 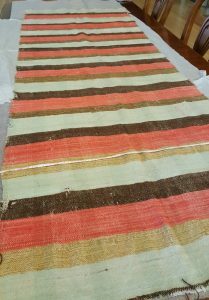 The Luther Bean Museum does not own any Colcha textiles, but since these are a form of Rio Grande weaving, a future addition of this type would add to the variety of our Rio Grande textile collection. 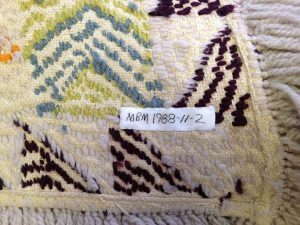 As part of my visit with Carmela Quinto, Curator of Collections at the Millicent Rogers Museum (MRM) in Taos, NM, we looked at some of the methods used to display textiles. After ascertaining that the textile is suitable for mounting or hanging, an appropriate display location is chosen to avoid exposing the textile to UV light or other possible damage. While textiles may be temporarily identified with an acid-free paper tag, the permanent means of identification is to sew a strip of cotton muslin with the accession number marked in permanent ink onto the back of the textile. Archival markers are available for this purpose. 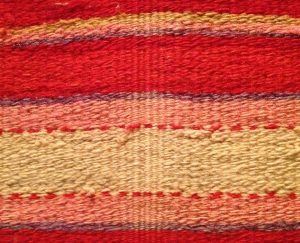 Weft-faced textiles such as Rio Grande textiles, are hung with the warp threads in the vertical position to give the best support to the textile. One method to hang textiles for display uses Velcro strips. 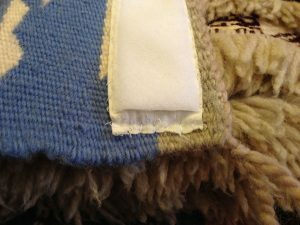 A strip of Velcro is sewn onto a slightly larger strip of cotton twill or muslin, which in turn is sewn onto the back of the textile at its vertical top end. Small textiles may have two short strips. Larger textiles have one strip that is the width of the textile. Very large or heavy textiles may have a number of strips, each the width of the textile, and at varying distances along the vertical dimension. The other side of the Velcro is attached to sealed or varnished wood strips that are affixed to the display wall. Another method to hang textiles for display uses sleeves. Cotton muslin is cut to the width of the textile and sewn into a hollow sleeve. The sleeve is then sewn onto the back of the textile at its vertical top end, leaving the sleeve ends open. The sleeve can then accommodate either a flat metal bar or a varnished wooden dowel. At left, flat metal bars work well with the spacers which are used to create an airspace between the textile and the display wall. 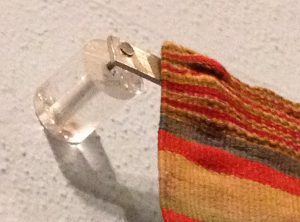 Below, a wood dowel through the sleeve, with eye screws at each end, works well for hanging a textile from the ceiling. I arranged a visit with Carmela Quinto, Curator of Collections at the Millicent Rogers Museum (MRM) in Taos, NM, and met with her on Thursday September 27, 2018. After brief introductions, we started right in on the many topics on which I had requested information, because there was so much to see and learn. As Carmela showed, demonstrated, and explained, I scribbled notes and took some pictures. We began with the storage area which is quite large relative to the storage we have at the Luther Bean Museum, but already filled with the collections of the MRM. 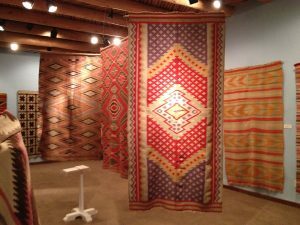 Weavings and textiles are arranged in groupings of: Navajo, Pueblo, Hispanic, and Mexican. They are stored on very large custom-built racks, each approximately a seven to eight-foot cube in area, with rows of horizontal wood poles instead of shelves. Storing the weavings on these wood poles involves layers of materials to protect the textiles. The wood poles are wrapped in a tube of cardboard or PVC, then in acid-free tissue. The textile is wrapped around the tissue and then encased in cotton muslin which is longer than the textile. Finally, the muslin is tied at its ends with cotton ties, tightly, to keep out moths and insects. 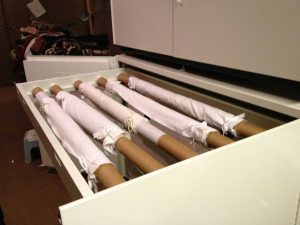 Small textiles are stored on much smaller versions of the horizontal wood poles, in drawers within cabinets. These are stored just as carefully with the layers of acid-free materials, and even though they are inside of a cabinet, are wrapped in the muslin with the cotton ties. Because the MRM building was originally a courtyard home, it is not as tightly constructed as a modern museum structure might be. Moths are the biggest pest the museum faces in terms of its textiles, and the museum has developed storage and fumigation strategies to safeguard its collections. An additional strategy has been to hang the display textiles away from the walls so that moths do not have a dark, seemingly enclosed place in which to hide. This airspace of about two inches also allows the staff to mildly shake each textile periodically to disturb any moth that may have temporarily stopped there. The textiles are hung by sliding a flat metal bar through a muslin sleeve that has been sewn to the back of the textile. The MRM used grant funding to bring in experts to identify and classify many of their collections. 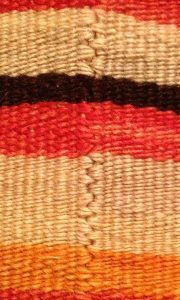 Suzanne Baizerman, PhD, was brought in to identify, classify and assess the condition of weavings and textiles. Carmela has done much of the identification and assessment of the Hispanic sacred Retablos (3-dimensional carvings or sculptures of saints, usually painted) and Bultos (2-dimensional, often wood or metal, painted with images of saints), and this is her area of specialization. All of the objects in the MRM collections have been photographed for documentation. This is different than photographing for publication. The documentation photography is for identification of the objects and the photographs are included in their database. 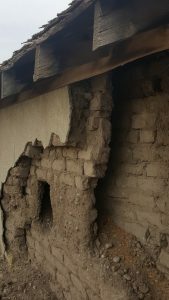 The MRM, originally a private home, is a Santa Fe hacienda-style adobe structure, approximately square in plan, with many rooms varying in size, arranged around a central open courtyard. 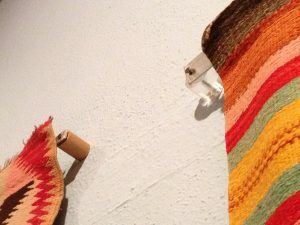 To reach the weavings exhibit, one progresses through a series of interconnected exhibition spaces with the assistance of a map, and passes through a two-foot thick archway into the exhibition space. 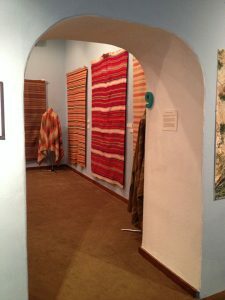 You are greeted by a roomful of colorful Rio Grande weavings. Most are hanging vertically against the light blue painted walls, four are draped as they would have been worn over mannequin forms standing in each of the four corners, and three very large weavings hang vertically from the approximately twelve-foot ceiling in the center of the space. I spent a solid hour looking at each weaving and examining many closely, to note the differences in fiber textures, weaving styles, and patterning. 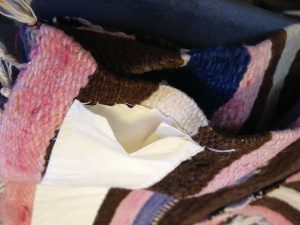 Having done some preparatory reading and attempted to understand weaving methods from photographs in books, it was very helpful to view actual textiles up close. I was quite impressed with the skills displayed by the carders and spinners and the dyers who made the fibers, and by the beauty of the patterns and the joinings in the weavings made by these often unknown artisans of the past. The exhibited weavings are vibrant and very well preserved. They present a wide variety of weaving styles, dye colors, and patterning, from bands and stripes to Saltillo-inspired diamonds to Vallero stars and much more. I could very easily have spent the better part of a day in just this exhibition. Back in June 2018, prior to beginning my Salazar Rio Grande del Norte Center Internship at the Luther Bean Museum, I had the good fortune to accompany Tawney Becker (my mentor for the internship and currently serving as the museum’s collections manager) and Amy Kucera (museum committee member) to visit the Center of Southwest Studies at Fort Lewis College in Durango, CO. We met with then curator and conservator Jeanne Brako, whose area of specialization is weavings and textiles. 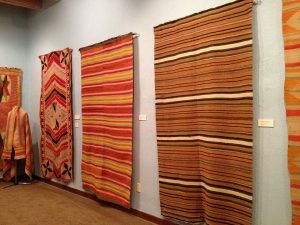 We briefly toured some of the exhibited weavings and made note of display methods. The bulk of our day we spent reviewing their database structure, as a preliminary to possibly using a similar software. Midday we enjoyed lunch on campus with Jeanne and some of her staff. After finishing with the database review, we returned to weavings. 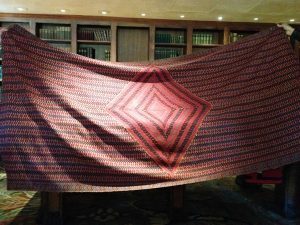 We had brought along the Luther Bean Museum’s most recent acquisition, a Rio Grande weaving, to show Jeanne and garner her insight into the period, fibers, dyes, and region of origin. It was a treat to see the textile removed from its wrapping and set out upon a work table large enough to hold it. Of course we all wore cotton gloves to handle the piece. 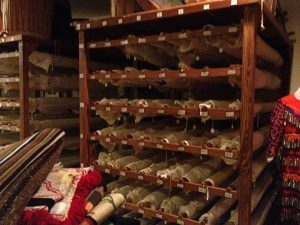 After this, Jeanne took us down to their museum’s large basement storage area, specifically to view their storage methods for weavings and textiles. (What a pleasure and a luxury to have so much space in which to store a large collection of so many varied objects). The tall, wide, heavy-duty steel storage racks for textiles can each accommodate probably several dozen large weavings, each wrapped around its own horizontal pole. Each is securely covered against dust and insects. We also inspected some of the mounting hardware used to hang the weavings. The Center of Southwest Studies houses a wonderful museum and I hope to return to spend time among the exhibits.